Annual Retreat: Opportunity or Obligation? “What? You get a whole week away just to rest?” How many of us have heard that comment, time and again, when people hear that priests are afforded a week every year to go on retreat. Many people don’t know what it means to go on a retreat; they might think it is another week of vacation. Unfortunately, some priests give the impression to parishioners that it is like a week at a country club or resort. 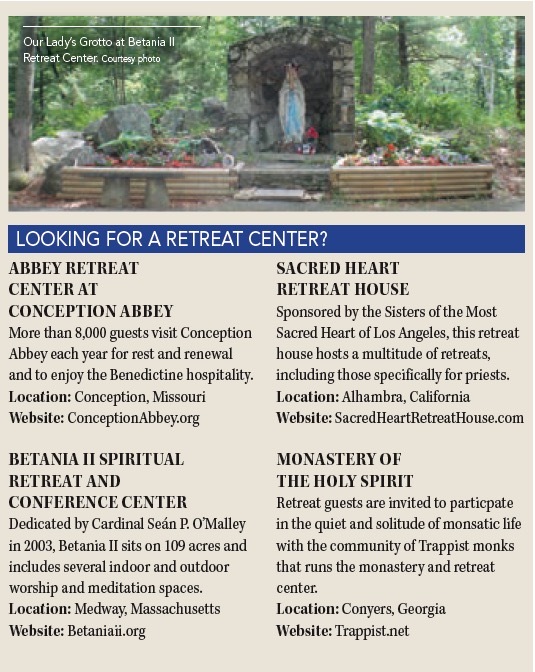 The truth is that the annual retreat is a life force for spiritual survival. People might equate it to their own life and see it as a week away from their family, their job and other responsibilities. For the priest it is meant to be a call to “come … and rest a while” (Mk 6:31). What have I found in my journey? Two things, extensively: encouragement and fellowship. I am encouraged because, for the most part, priests are happy in their lives. Despite the fact that many are overworked, the retreat offers them the time and place to be still and relax. For many priests, the pace and workload of ministry can result in a dormant prayer life, where silence and reflection are derailed. A good retreat will begin by allowing the priests the quality time to come to stillness and rest. As for fellowship, in the United States many priests live alone, so they are doing many things besides offering Mass. At one retreat in the Midwest, Father Peter, a 75-year-old priest, asked me, “How can I take time off, since I am the only priest covering five small parishes?” I had no answer. Many priests find themselves in the same situation as Father Peter. They feel that they do not have time to take a day off, and when they do, they might not know what to do with it. They can get caught up in the “doing” of ministry, and it will be challenged by the Gospel call of Jesus to “come away … and rest awhile.” Just the thought of being with brother priests and praying together on the journey is a great opportunity to experience the blessing of a retreat. Priests such as Father Peter welcome the opportunity for a retreat simply to be around their brother priests and to rest in one another’s company. It is dangerous to look at a retreat as an obligation rather than an opportunity to rest and attain personal refreshment. 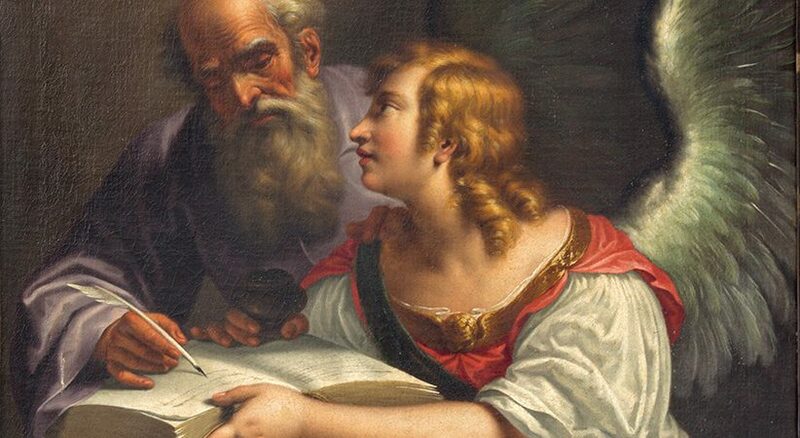 Some think that we are bound by canon law to make a retreat, but the binding part of a retreat is the invitation to make the time for ourselves. The annual retreat becomes a welcome part of our life that no parish or bishop can take away from us. Canon law states that priests “are equally bound to make time for spiritual retreats according to prescripts of particular law” (Canon 276.2.4). If we see this as an obligation we can develop an unhealthy/cynical attitude that deprives us of a great opportunity to be with brother priests who share the same joys and challenges. An obligation can create an attitude where we can grow more distant from the other priests who share the same lifestyle as we do. We easily can begin to mount up the many reasons why we shouldn’t go to a retreat. After a while, those reasons sound justifiable, and we can begin to adopt them as an excuse not to make a retreat. For some, private retreats have become a regular practice. To make a private directed retreat, priests will make their own arrangements and tailor the retreat for what they desire. These private retreats do allow the priest to enter into an experience of God that meets him where he is with the relationship and fulfills his desire to be fed spiritually. Other priests do not like the diocesan retreat and choose not to go on retreat at all. It is not uncommon for me to hear a priest say, “Father, this is my first retreat in 15 years.” Another priest had not made a retreat for the first 10 years of his priesthood, and now he was coming to me for spiritual direction while he was on a leave of absence. To see the retreat as a magic potion that will keep our priesthoods on the right track keeps us from the intimacy that time away with the Lord can make possible. The Lord’s exhortation to “remain in me” (Jn 15:4) is all about accountability in relationship. Never forget that the invitation to retreat comes from Jesus. He said, “Come away by yourselves to a deserted place and rest a while” (Mk 6:31). It is an invitation from God to receive the much-needed physical and spiritual refreshment that nourishes us. The heart of any retreat is the silence and the time spent with brother priests. The word “retreat” itself is defined as a place of privacy and safety. Yet there are negatives that we can carry into a retreat. Too often we think the quality of the preacher is going to make the retreat. Let’s face it, sometimes we go on retreat to see if we can pick up some good preaching points to bring back to our parish community. That motivation prevents us from listening with the heart as we rest in the Lord. Retreats are not meant to be places to do homework, but places of refreshment. It is a time for me to be ministered to — not a time to get refueled but to be refreshed. Psalm 23 can remind us of what the Good Shepherd desires for us. Here are some things that priests have complained about regarding the diocesan annual retreat. Some don’t like the country-club atmosphere. Some want more silence. Some feel it is the same old stuff with the same old people. Some say that it isn’t inspiring and that they get nothing out of it. Some say the parish demands are too great and prevent them from getting away. Some don’t like the gossip and political talk regarding the diocese. I also hear from priests that retreats can be lame. In my observation, I find that there are different reasons for a retreat to seem ineffective or, frankly, boring. One of the big reasons is connected to the number of years a man has been a priest. The men who have been ordained for 30 years or more have a certain camaraderie they share with old classmates and therefore enjoy the stories they have heard over and over again. For them it’s the gathering of brother priests that brings these men together. That’s why the preached retreats seem to attract the retired/older men more than the younger. The younger priests might feel left out because they don’t feel a part of that history. As a result, many younger priests do not attend the preached retreats. These younger priests might have experienced a silent directed retreat during their formation and prefer that to a preached retreat. They might be drawn to the silence more than the bonding together with priests from around the diocese. They might have a need to get away somewhere and be alone with the Lord. Some dioceses encourage this and allow for that diversity by offering silent directed retreats as one of the options for the men. It is also my experience that many younger priests never really learned how to live rectory life. If they are with another priest, they still might feel like they live alone. The priests of advanced years likely lived in rectories with a few men sharing meals and a life together. The recent past has made that kind of rectory life almost impossible. Yet today there are priests who have made a conscious effort to pray together at least once a day and to work together to make a daily meal. In one case the pastor was ordained more than 20 years; the other priest was ordained one year. That relationship affected their ministry, their daily interactions and how they saw the need to pray together. The bond they created living together has continued after they had moved on to other ministries. They agreed that, when possible, they would come together on the same retreat, praying together and resting with the Lord together. The retreat can be a place to come together as brothers and not a place for resolutions, but a place for renewing the original call, to take the opportunity to rest with each other in the presence of the Lord. Maybe it is time to rethink these retreats. It is important to design a retreat that fits the needs of participants. One of the things I learned is to never ask on the first day of retreat, “What kind of retreat would you men like?” I find it better for the diocese to let me know what works for them. Ideally, the week should be one filled with hope and encouragement, to prevent the disease of cynicism that can turn us against any good that can happen. If silence is an important part of a retreat, then how is that silence fed during the year? Silence needs to be practiced so when a priest goes on retreat it is not a foreign experience. One of the reasons why silence can be difficult on retreat is because it might not be practiced in a priest’s daily life. The demands on him can be overwhelming to the point where silence no longer is part of his day. For our prayer to be effective, silence must be a major component. This should be reflected in the retreat. To do this, the retreat needs be in a place where privacy and safety are honored, where nature is close at hand and where priests can feel comfortable being inside and outside. In that light, we cannot minimize the need to gather as brothers. Being together in silence and prayer will build bonds of a grace-filled community. Silence is that particular dimension of a retreat that needs to be addressed as an important part of diocesan life — especially because priests are more alone in their life and ministry. FATHER VINCENT FORTUNATO, OFM Cap., lives in Wilmington, Delaware. He teaches spiritual direction and preaches parish missions and retreats for priests.